Did you know that the 'wild west' was made from the 'myth of man'? Moreover, that 'man' was made by the 'myth of a the circus'? OK, I know that this statement does sound rather cryptic when you say it out loud. But still, the truth in my words is reflected in this film. One Directed by and Starring Clint Eastwood, with Sondra Locke, Geoffrey Lewis, and Scatman Crothers. It was made in 1980, and lasts for 116 minutes. Meet "Bronco Billy's Wild West Show", a down on its luck travelling circus that is in dire need of some tender loving care. Now the star of this show is none other than Bronco Billy McCoy himself (Clint Eastwood), who is a gunslinger that performs numerous acts of dexterity with the aide of a horse and -- if they stays around long enough -- a damsel in distress. Other people who help Billy in his quest to provide entertainment include people like the lasso technician, Lefty LeBow (Bill McKinney); two Native American Indians, Chief Big Eagle and Lorraine Running Water (Dan Vadis and Sierra Percheur), and of course the enigmatic master of ceremonies, Doc Lynch (Scatman Crothers). Sluggishly, this road show travels from town to town, until eventually Billy has to go to a local city hall, so that he can get some permits filled for his act. However, at the same time that Billy does this, socialites, Antoinette Lilly and John Arlington (Sondra Locke and Geoffrey Lewis) are also at city hall as well, applying for a licence to get married. You see, Antoinette has to get married before she’s thirty so she can inherit a large fortune from her deceased Father's estate. That's why she's arranged for John to marry her -- for a fee -- so that she, in turn, can splash her dead fathers cash from here to eternity. Sounds like a simple thing to do, right? Nope. I am afraid not. Because the very next day, when Antoinette awakens, she discovers that her 'husband' has left her with only the clothes on her back, making her realize that she now has to fend for herself. Ooops! So who does she turn to for help? No. Not Ghostbusters. Bronco Billy of course, because he is nearby, and agrees to help her out only if she becomes his new side-show assistant. As yet another day passes, however, Antoinette reads in the local press that her 'husband', John, has been arrested and sent to a mental asylum, as the police now believe that he has killer her, prompting her to stay with Billy for as long as she can. OK, I know what your thinking to yourself. Why 'double oops', huh? Well, regrettably, a lot of events play out over the following couple of day, which make it very difficult for Antoinette to stay with this show. For example; (1) Both Chief Big Eagle and Lorraine Running Water are expecting a baby, and need more money. (2) After a bar-room fight, Billy and Lefty are temporarily detained by the police. (3) The circus is not earning enough money to make ends meet due to these delays. Plus (4) Worst of all, is that the circus burns down because of its inept facilities. OK, I know what you are wondering to yourself again. Why does all of this makes it difficult for Antoinette to stay in the circus? Apart from it being turned into ashes of course. Well, if you think about it for a moment, all the circus performers begin to come to the realization that Antoinette is 'back luck', as bad things have happened to them as soon as she joined. Oh! Though I suppose that is why what next transpires is a right coming of age tale I can tell you. As the past informs the future - a circus is built from a crazy suture - husband and wives split - and legends begin with a touch of true grit. You know the feeling that you get when you come in from the cold outside, and bathe in the warm glow of central heating. Well, that’s what the film 'Bronco Billy' does to me. It just makes my skin tingle all over every single time I have watched it. As it makes me happy with the message, the actors, the style, and the overall package -- just like a pauper who has won the lottery. OK, so it’s not a grand battle sci-fi movie extravaganza, with all the knobs and whistles thrown in for good measure, HONK-HONK!!!! But then again, it’s not meant to be either. You see, from my perspective, this flick is a mixture of a number of things really. All of which are very personable on many levels. For a start, it is a story of a bygone age -- where people made themselves be what they wanted to be, and did not over-complicate matters with acts of society or life. Next, I would have to say that this film is about family too (or 'surrogate family' to be precise) -- all of whom have come together to bring happiness into the world of video games and the media. Plus finally, this is a movie about the value of happiness -- and how love is a commodity that can never be bought. Fair enough, I am sure that some of you skeptical surf-hounds out there might call this film 'naive'. Whilst I, myself, would call it a very charming piece of cinema that is presented by some very charming actors. Clint's character, Billy, is the leader of the group -- who shows his followers what they should be by his stoic example. Sandra character, Antoinette, is the cold faced b*tch -- who learn from her time away from the privileged braggarts to become something else. And as for the rest of the cast -- they all support, enhance, reinforce, and emolliate, both the tone of the tale and the arc of the story. However, there is one notable exception to what I have just said - Sondra Locke. Well, maybe it’s just me, but in 'Bronco Billy', I did find her to be slightly too annoying at times. Honestly, at the beginning of the film, I felt so sorry for her poor husband (Geoffrey Lewis), that I did not really blame him for leaving her in the way that he did. OK, I understand that this is part of her character -- an ice cold queen. Though I do not think that she realistically redeemed herself at the end of the film -- it just felt too contrived as a conclusion goes. Still, this point is only a minor complaint really, comparing the picture as a whole. Here, just look at the fact: (1) The Museum of Modern Art in New York City invited Clint to showcase this film at a special screening, marking him as a film-maker of note. (2) This was the final film project for art director, Eugene Lourie. (3) Clint stated that this was one of his favorite film projects, because it was his ode to famed film-maker, Frank Capra. (4) Geoffrey Lewis is Ethan Suplee's Father-in-law. (5) Whist making this movie Clint was divorcing his first wife, Maggie Johnston, so he could avoid sharing any of the profits with her, by making it outside of his own production company, Malpaso. The first film for him since 'Kelly's Heroes'. (6) Sandra Locke was Clint's partner from 1975 to 1989. They never married. (7) The night-shift guard at the insane asylum was whistling the theme tune to another of Clint's films, 'Every Which Way You Can'. (8) Scatman was a close friend of Jack Nicholson. (9) Bill McKinney was once a tree surgeon. 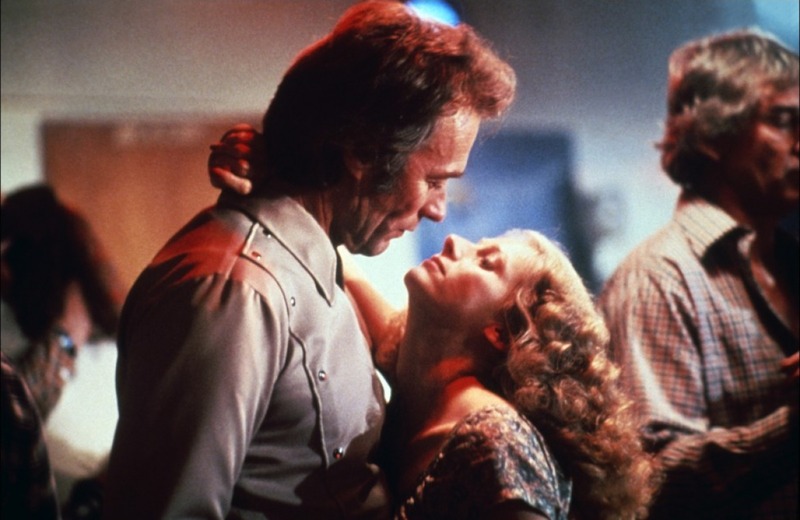 And (10) This was the fourth of six movies that Clint made with his then real life partner, Sondra Locke. Plus the forth movie he made with Geoffrey Lewis too. Overall, 'Bronco Billy' is a really great film. Its cleanly directed. Simple to follow. Nice to watch. Plus it is especially reminiscent of the feeling I get when it is cold outside, and I have just entered a room with the central heating on, HONK-HONK!! What do you say to that Clint?